Kung pao shrimp. Good. Tacos. Good. Together? Mindblowing. Hitting the trifecta of quick/easy/healthy, this one is weeknight gold. Sub in chicken if that’s what you’re feeling, but either way, this will go into the weeknight rotation instantly. Preheat oven to 400 deg F; toss a baking sheet inside to preheat as well. As oven heats, mince garlic and ginger. Combine with gojuchang, soy sauce, sriracha, rice wine vinegar, honey, and corn starch into saucepot on low heat. Remove baking sheet, spray with non stick, and roast shrimp until pink, ~5-7 minutes depending on size. 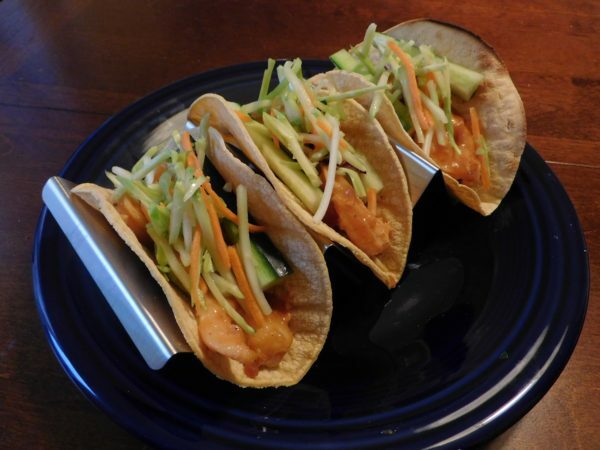 As shrimp cooks, dress slaw with salt, pepper, and a splash of rice wine vinegar. Dice avocado, slice scallion, set aside. When shrimp are cooked, immediately toss into warm kung pao sauce to coat. Assemble tacos, garnishing with avocado, scallion, and sesame seeds. *Get whatever size shrimp looks best and is the most affordable. I do highly recommend raw, as the shrimp is cooked essentially twice. **Don’t have gojuchang? No worries. Add ¼ cup of beer with a healthy pinch of red pepper flakes and of sugar.